Derby opened the 2018/19 season with a win snatched in the 94th minute at Reading Friday night. The game wasn’t a classic by any stretch of the imagination, but it was three hard earned points and gets us off the mark straight away! It’s now ten years since we lost on opening day and that was our very first match after being relegated. Opening day can often through up some odd results and often smaller clubs beating the bigger ones. Many have tipped Reading for a season of struggle and possible relegation candidates. Whilst I don’t think they will be promotion contenders, I saw enough in their side to alleviate any fears of the drop. We struggled early on with trying to play the ball out from the back, but as everyone knows changes take a little time and Rome wasn’t built in a day. Patience will be needed and what you also have to bear in mind is the fact that three of our new signings didn’t play. Two of them George Evans and Jack Marriott didn’t even make the bench. Reading dominated in the first half and they went ahead early in the second half through a brilliant headed goal from Bodvarsson. This was after Derby had started off much quicker in the second period of the game. Persistence paid off when Mason Mount opened his account with a long range effort on his Derby debut. The winner by Tom Lawrence was a brilliant finish! Mason Bennett playing a great ball into the box and Lawrence getting his head to it to give Mannone no chance. As we have already stated, it will take time for the players to get used to a new style of play. Also we still have to see Florian Jozefzoon, Jack Marriott and George Evans on the pitch. Two players who could benefit from new management are Craig Bryson and Mason Bennett. Bryson back after a loa at Cardiff put a shift in and Bennett impressed when coming on as a substitute in the second half. Bennett has found himself loaned out in previous seasons and has had more than his share of injuries. Is this the season that he finally makes the break through? One thing that no Derby fan could have missed on Friday night is the passion shown by the Derby bench. 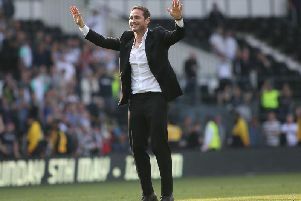 Frank Lampard, Jody Morris and celebrating Lawrence’s winner like fans. That’s what Derby County are all about! I love to see a bit of pride and passion in our team. Lets hope we can see similar both on and off the pitch next Saturday tea time when Leeds come to visit.